Before Sly and the Family Stone came along in 1967, no band had ever sounded like them, and since they disbanded, only Prince and D’Angelo, in his finest moments, have built on their sound. 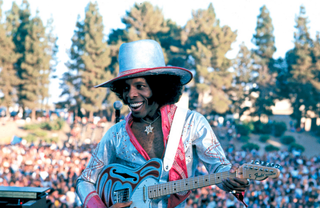 Sly and the Family Stone were unique, legendary and yet possibly underappreciated in their heyday (roughly from their formation in 1967 to 1975, when the last of the original band members, except Sly, left the group), which coincided with the peak eras of Jimi Hendrix, James Brown, Marvin Gaye, Janis Joplin, the Rolling Stones, Al Green and um, etc., etc., etc. They were the first co-ed, biracial group in popular music. On Friday, Legacy Records will release the four-CD box set, Sly and the Family Stone: Live at the Fillmore East October 4th & 5th 1968. It's the first live recording from a group whose best trait was its kinetic live shows. For instance, watch the group tear it up with a medley on The Ed Sullivan Show in December 1968. The gig at the Fillmore East in New York City came at an auspicious moment in the band’s development. It had released two well-received albums, 1967’s A Whole New Thing and Dance to the Music in 1968. The title track of the later recording became the group’s first top 10 hit. In September 1968, the band went to Europe for its first international tour, but it was a failure because of poor sound systems that were ill-equipped to handle a band with two horns, a bass, guitar, keyboards, organ and several vocalists. It's easy to break the band’s peak era into two parts: the lighter side, ’67-’70, and the darker side, ’71-’75. During the lighter side, the band’s influences, from gospel to Otis Redding’s up-tempo songs, are in full effect. With the release of There’s a Riot Going On in 1971 and 1973’s Fresh, the slower, stripped-down and funkier arrangements (think “Family Affair” and “If You Want Me to Stay”) became the centerpiece of the band’s sound. Sly was a gifted songwriter with a great ear for melodies and carefully crafted harmonies, and these discs are a showcase of his genius. He was also a dynamic bandleader, and the band roars with the fervor of a gospel tent show intent on converting the skeptics. Sly was known for jumping off the stage and doing the hambone, and according to drummer Greg Errico, he got the audience at the Fillmore to follow him out of the building and then back in. The versions of “Dance to the Music” are a highlight, but there are several others. The band does a wonderful rendition of “Don't Burn Baby” (in which Sly urges, “Learn, baby, learn”). The most interesting piece is the medley of Redding’s “I Can’t Turn You Loose” and Sly’s “Turn Me Loose,” which gives a nod to one of the cornerstone influences of the band. Snippets of the band’s future sound crop up repeatedly. The chord progression from “Everyday People” shows up in one solo; the bass line from “Thank You (Faletinme Be Mice Elf Agin)” shows up in another. While funksters can geek out for hours on this music, these four discs are also potent party soundtracks. The nicest thing is that there’s little air of nostalgia to this music. It sounds, well, to quote the Sly classic, fresh. But there’s one little thing: The liner notes show the ticket prices. Front orchestra seats were $5.50. That’s worth feeling nostalgic about.